GP Halls CD 'Embarkation' has been slightly delayed due to problems with printing. Just to wet your appetite here is a photo of GP from the 70s with the pianos he used to record his Estates album. 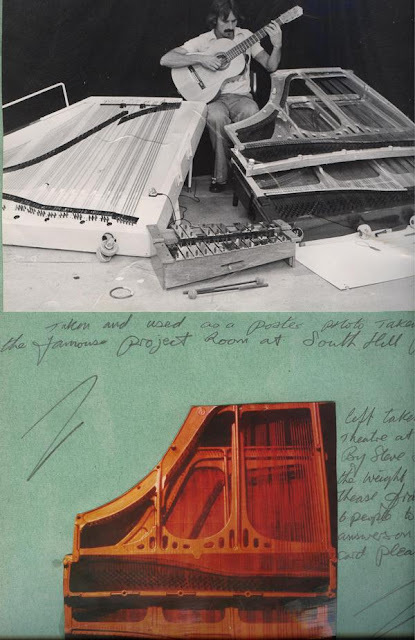 These piano frames were made by myself in 1970 and were the first Industrial Sound-Sculptures a genera I invented. I used them also with a mobile theatre company touring Europe, called "engineers of the imagination" (Welfare State) based at the time in Burnley Lancashire, and were last seen being burnt in a fire sculpture installation somewhere.